Last week, I described the conditions that are leading to the growth of coworking spaces across the country. More than just the sharing of office space, coworking is focused on building community and fostering “creative serendipity”. Many coworking spaces have quirky and unique layouts, with shared worktables in lieu of offices or cubicles. Desks may be unassigned, with workers taking a seat wherever one is available, moving between different areas throughout the day. The first official coworking space opened in San Francisco in 2005. Since then, the concept has grown steadily, and there are now over 1,000 coworking spaces nationwide and over 3,000 around the globe. Here in Vermont, the coworking movement is also growing, fueled by a community of high-tech workers, creatives and entrepreneurs. According to the 2013 Kauffman Index of Entrepreneurial Activity, Vermont is the second most entrepreneurial state in the country, with 520 startups per 100,000 adults. The newest coworking space in our region will soon be open for business in downtown Hanover, NH. The Dartmouth Entrepreneurial Network will be expanding their support for young entrepreneurs with the new Innovation Center and New Venture Incubator. This coworking space is geared toward helping startup ventures in the early stages of development. The coworking typology will work here because what young entrepreneurs need most to get their ideas off the ground is a supportive network of people with similar interests and relevant experience. 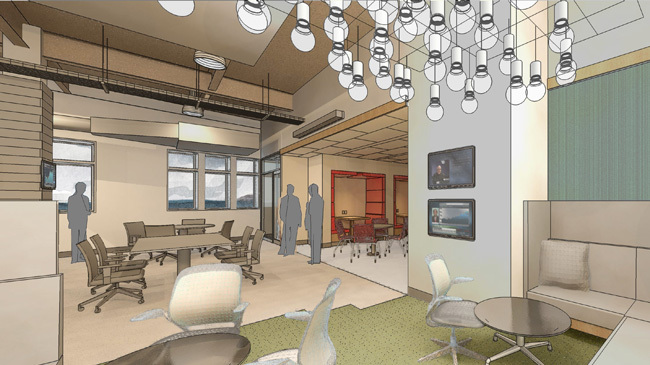 At the Innovation Center, individuals and small teams will work side-by-side at shared work tables. The open Hive is complemented with small meeting rooms and private phone booths for occasional meetings with collaborators or potential investors. And in the Creativity Lounge, individuals can slip into a booth or pull up to the bar to recharge and plug in. This is what is driving entrepreneurs and the self-employed out of their homes and coffee shops into community coworking spaces like this one: a supportive network of creative people; educational opportunities and networking events; physical spaces that foster creativity; and a coffee bar that’s open all night. A version of this article appeared in the Burlington Free Press, Creative Corner, on Thursday Dec 26, 2013. You can read the online version here.